Durango School District 9-R has adopted academic calendars for the 2017-2018 and 2018-2019 school years. Click "read more" to see the full calendars. The vision for Hour of Code is that every student in every school should have the opportunity to learn computer science, just like biology, chemistry or algebra. Code.org organizes the annual Hour of Code campaign which has engaged 10% of all students in the world, and provides the leading curriculum for K-12 computer science in the largest school districts in the United States. Lots of Upcoming Events - Be Sure to Read !! Please see the attached Request for Proposal for a photo vendor to serve all 11 schools within the district. Durango School District 9-R announces the formal opening of a request for proposal for the needs of a Micro-Bus and a Service Truck. 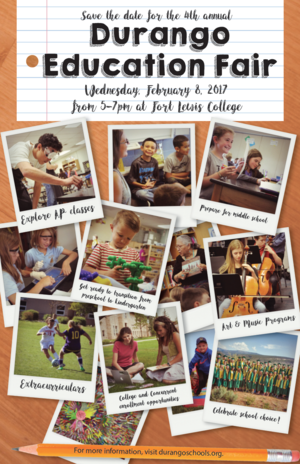 The 4th Annual Durango Education Fair will take place on Wednesday, February 8, 2017 from 5-7pm at Fort Lewis College. This informational fair celebrates the wonderful and unique educational choices and opportunities available in our small town. From innovative public schools, to a variety of private and parochial schools, to rigorous charter schools and many higher education opportunities, Durango-area schools offer choices, diverse curriculum and opportunities for every family from preschool through higher education. We hope everyone enjoyed a fun and safe holiday break! We look forward to welcoming you all back to school tomorrow, Monday, January 2, 2017. Today, the Colorado Department of Education released the state’s Partnership for Assessment of Readiness for College and Careers, or PARCC. This marks the second year that the PARCC assessment has been administered in the Durango 9-R school system and parents will soon receive score reports that detail how students performed on last spring’s assessments in English language arts, math and science. Through a Durango Education Foundation (DEF) core academic grant, the Durango 9-R Title VI program has been able to partner with the Durango Public Library to bring author Dr. Evangeline Parsons-Yazzie to Durango for a special cultural literacy enrichment program. Dr. Parsons-Yazzie will also be visiting some of our schools and reading her book to our students.